With regulators stepping-up on enforcement, any business can be a potential target for raids and investigations, regardless of size, industry, or track record. Malaysian regulatory authorities such as the Malaysian Anti-Corruption Commission and Malaysia Competition Commission have wide investigation powers at their disposal including carrying out unannounced raids (with or, in certain circumstances, without a warrant), seizing physical or electronic files, sealing management office or operation facilities, recording statements and making arrests. A proactive approach to prepare for raids and investigations is critical. With preparation, businesses are able to cooperate with the authorities efficiently and at the same time ensure that legal rights are protected with minimal impact to business and operations. 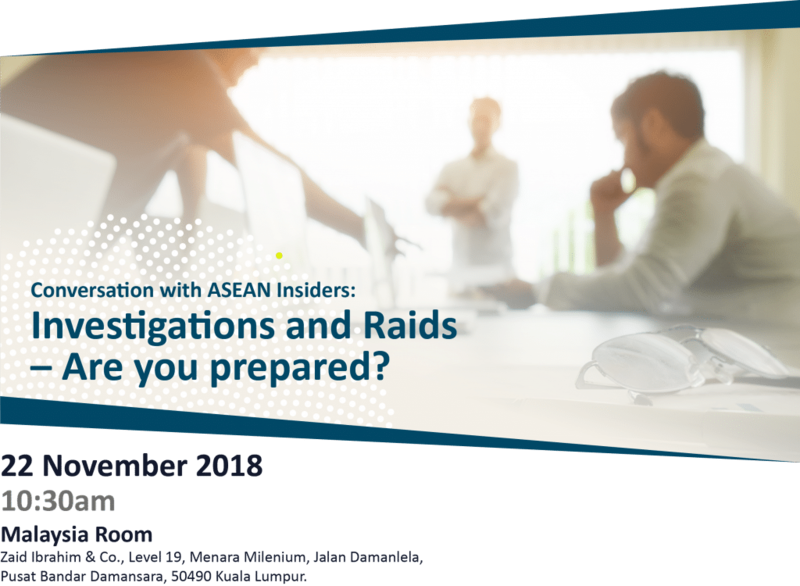 Join our partners Nadarashnaraj Sargunaraj and Saritha Devi Kirupalani, for the session “Investigations and Raids – Are you prepared?” on 22nd November 2018, where we will be sharing experience on raids and investigations, thoughts on how to be prepared, stress-testing existing protocols and pitfalls to avoid. Seat are limited and will be allocated on a first come first served basis, so click below to RSVP now!